You may register only one powerboat (over 10 hp) per membership. There is no limit for non-motorized watercraft, or for those 10 hp and under. • Meet current US Coast Guard safety equipment and safe operation requirements. • Conform to Watercraft Length Rules (Sec. 207, E 2, HVL Bylaws, Rules & Regulations). • Observe all HVL Lake & Watercraft Rules. • Display current registration stickers by May 1st of each year. • Have the current year’s laminated Lake-Watercraft Rules card onboard at all times. • Airboats, jet skis, powered water skis, ATVs and powered personal watercraft are prohibited. • Complete and return the New Boat Registration form along with the current year’s Boat Registration Checklist and Boat Driver Exam. • Show proof of ownership and length of the watercraft (title, state registration or Bill of Sale). • Show minimum liability insurance coverage (required annually). • Pay the annual watercraft registration fee. • POA staff will measure any new power boat or new pontoon boat to verify the length. • Place the registration stickers in the designated locations on the watercraft. • Boat trailers must also be registered with a permanent sticker available at the POA Office. 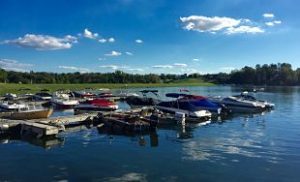 Residents may lease an available HVL POA boat dock on an annual basis. Dock space is assigned to property owners based on previous rental and availability. To have your name added to the waiting list for available dock space, please complete and complete and return the Dock Waiting List form. Dock spaces are for watercraft registered to the leaseholder only, unless you make other arrangements with the Community Manager. You may not sublease a POA dock. The sluice gate is open from the first Monday of November to the Saturday before the first Monday in March (check calendar). Damage to watercraft may occur if left in the water during this period. To drive a golf cart or moped on Hidden Valley Lake roads, you must register the vehicle with the POA Office each year by April 30. • Complete and return the Golf Cart Registration form. • Show proof of insurance. • Pay the $25.00 annual registration fee. • Place the registration sticker on the left rear bumper of the cart. • Other motorized vehicles*, including ATVs, must be registered with the Indiana BMV first then with the POA. • Obey traffic signs, speed limits and rules of the road. • Pull your golf cart over to allow auto traffic to go around. • Keep your golf cart in safe operating condition. • Have lights and turn signals for night driving. *For HVL POA regulations concerning other motorized vehicles, please see Section 215 of the Bylaws, Rules & Regulations. A fishing license is not required to fish in HVL lakes. Fishing is allowed 24 hours a day. Guests not accompanied by POA members or their immediate family members must have a valid Guest Fishing Permit to fish in any HVL lake. Permits are available from the POA Office for up to 3 guests per day. You may obtain a 1-, 2- or 3-day guest permit. Any one guest may fish for only 3 days per month. The cost is $1 per person per day. The only types of signs that have automatic approval are garage sale, political and real estate signs. You may display political signs up to 30 days before the election and one day after. The limit is one political sign per lot. You may display garage sale signs up to 24 hours in advance, but must remove them immediately after the sale. You must obtain Yard Sign Approval from the POA Office to display any other type of sign, such as charity, school or contractor signs. Signs may not exceed 3 feet in height or width or 6 feet in height, unless approved. Do not attach signs to trees, street signs or corner posts on community property, nor in front of the wall at Alpine and Hidden Valley Drive. Please see Section 214 of the Bylaws, Rules & Regulations for more detailed sign rules.